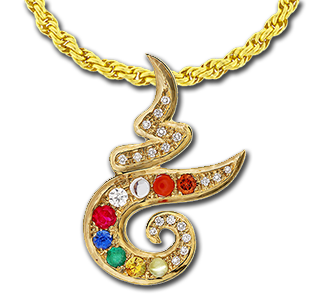 Translation: Ruby for the Sun, Pearl for the Moon, Red Coral for Mars, Emerald for Mercury, Yellow sapphire for Jupiter, Diamond for Venus, Blue sapphire for Saturn, Hessonite for Rahu (the ascending node of the Moon), and Cat’s eye for Ketu (the descending node of the Moon); (these gems) must be high-born (top quality) and flawless – Ref. Mani-mala: 575/79 (1879). At Astral Gemstone Talismans we are creating highly personalized designer jewelry since the publication of our book, Chinta Mani, in 1975. Subsequentially we furthered the cause through our twice published, Handbook of Planetary Gemology (1982 and 1988), and later with the publication of “Ancient Astrological Gemstones & Talismans” in 1995 and 2007. In 1989 we started serial numbering our brand, Astral Gemstone Talismans, beginning with piece number 1, and we are now in the 19,000 series collection. Each piece number is hand-stamped into the 21k gold, 18k white gold and/or 925 silver body of the amulet, which comes with a matching number certificate that gives gemological and astrological information on the specific talisman and its use. 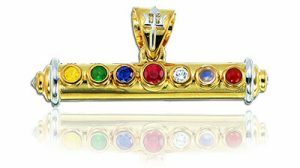 Our goal has always been to create and distribute exceptional astrological gemstone talismans using top quality astrological gems, herbal bhasmas, planetary symbols, and certified serial numbers, in handcrafted 18k or 21k solid gold and/or 925 silver settings designed by artist & gemologist, Richard S. Brown, and created in harmony with your own personal sidereal or Asian astrological horoscope. To begin let us help you determine what gems are most favorable for your life. Some clients already know what astrological gem they want. When you know what gem(s) are best for you, then please visit our On-line boutique, where you can view our talismans and gems by planet and / or style. For more information you are welcome to write to us when we can discuss the availability of Jyotish-quality gems and unique designs with you by email. Or please visit AGT in person at La Villa Ari and select trade shows when in Bangkok, Thailand. Welcome!